For a year and a half the only thing in our dining room was a table. I decided that was long enough, and it was time to finish the room. I started by looking for some type of buffet or sideboard to go against the big empty wall, and had sticker shock for everything I liked. I began the Craigslist hunt, and quickly found a great credenza and hutch. I knew I liked it, but wasn't sure if it would go with the table. So what did I do? 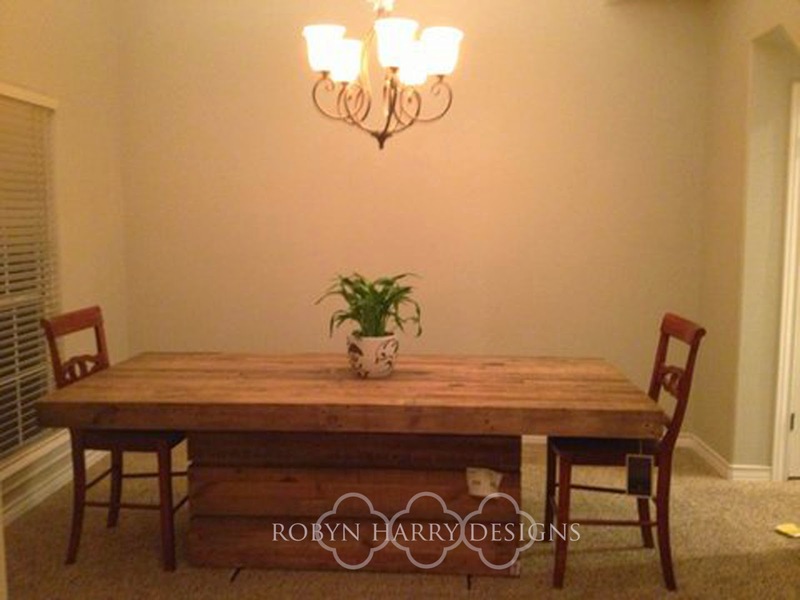 Text pictures and send the ad to Robyn Harry Designs for help. She gave me the affirmation I was looking for, and said she thought it would be great in the room. I was still having second thoughts about it, and found another piece on Craiglist that I kind of liked. I sent the pictures to Robyn to get her take. She helped me see that size and scale of the first piece were a better fit for the space, so I pulled the trigger, and sent my husband and his truck to pick it up. When we got it in the space, I was so happy with the choice we made. Next, I wanted to fill the hutch up, but I wasn’t sure with what. 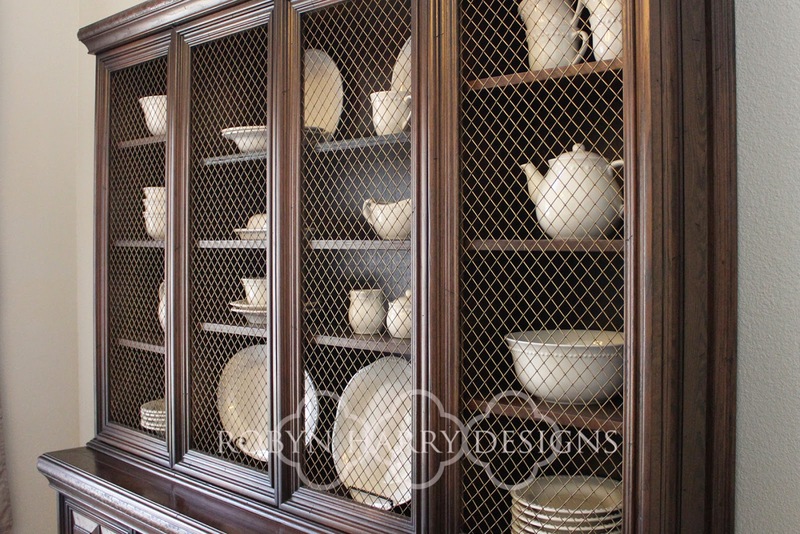 I knew I wanted to have some of my everyday dishes in there, but I also thought about doing wine and some glassware. After putting a few pieces in, I sent a picture of it to get Robyn’s opinion. She advised me to go with big, bold opaque pieces, and assured me that a hutch full of cream pottery was “dreamy.” I was glad to hear that because after 8 years, I’m still in love with our everyday dishes we got for our wedding, and I’m excited to now have them on display. The next thing I was anxious to buy was seating. I found some great chairs at World Market, and they just happened to be having their dining room event, so I was able to get them at half price. Score!!! Before actually purchasing them I sent a picture to Robyn to make sure they would coordinate. She said they would, and challenged me to get a few round backs and a few square backs but I just couldn’t do it. I wanted to stay in my little safe area, and she happily let me camp out there. I got 6, and continued on. The next thing I bugged Robyn about was window treatments. I was stuck between an ivory color or an oatmeal color. She said she would go with oatmeal since the room was already filled with a lot of ivory color in the chairs and pottery. I agreed. 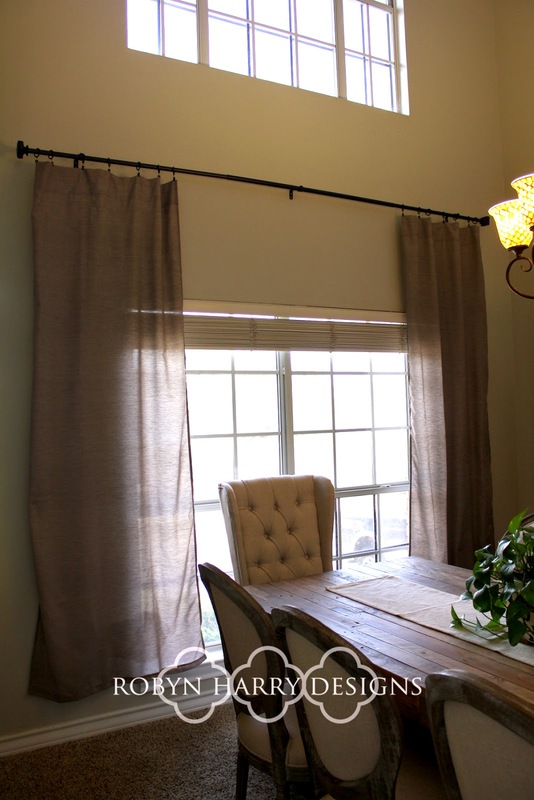 I found this 96inch curtain panels for $9.99 at Ross. Yes!! Not sure if you can tell, but I live for bargains. After consulting her on every step of the way, I wanted to try to make the last purchase on my own. This little bird felt ready to fly. 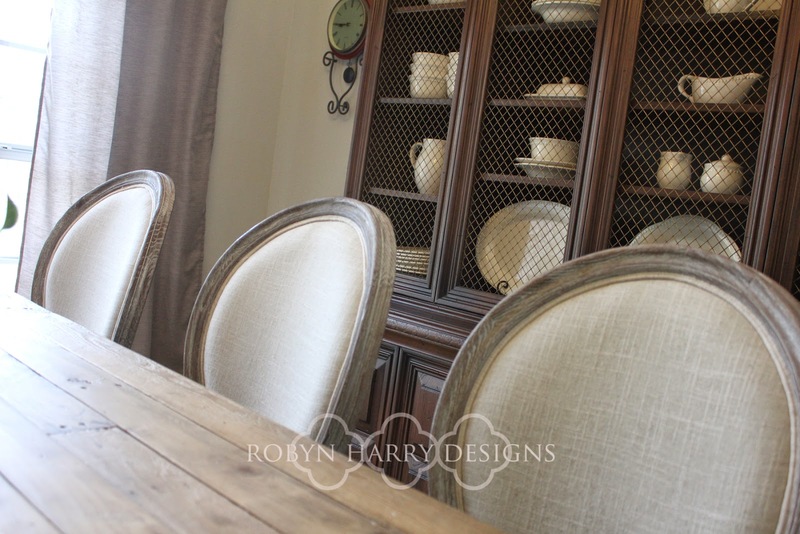 I picked these great captains chairs for the ends of the table, and I could not happier with them. Of course they were on sale at overstock.com. What do you think Robyn? Did I make the grade? So here is the completed room, and I LOVE it!! 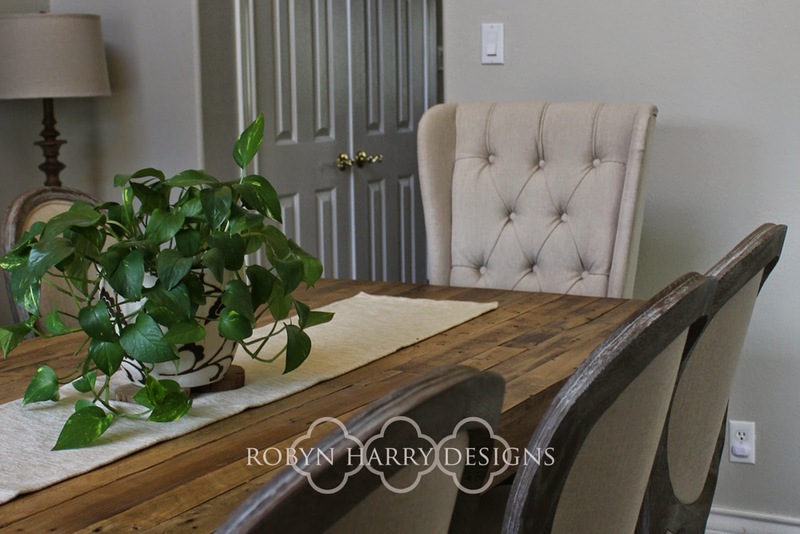 I love walking down the stairs and seeing this dining room finished, and seeing it finished with pieces and touches that make me happy. I loved doing this process with my sister. She was so incredibly helpful. I always feel pretty confident in the design or look I’m going for, and still I used her at every step. Having another set of eyes on what you’re doing helps a lot, and I really felt great about having her affirmation for choices I was making, because after all, she is a designer. Did you know that I live in Texas and she lives in Florida? I completed this entire room with her help, and she never once saw the space in person. Everything was consulted on using iphone pictures, and few short phone calls. 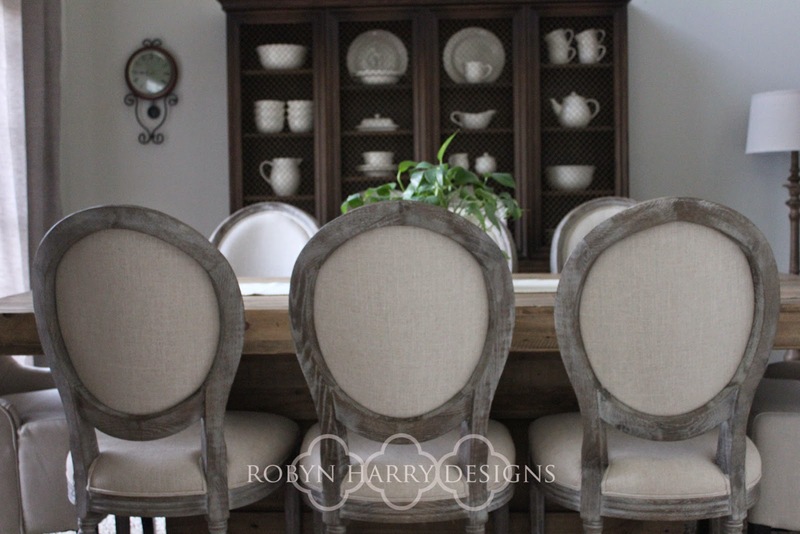 If you are creating, redoing, refreshing, overhauling, or transforming a space, I highly recommend asking Robyn Harry Designs for help along the way. She will guide you and make suggestions for you in a style that you want and like. 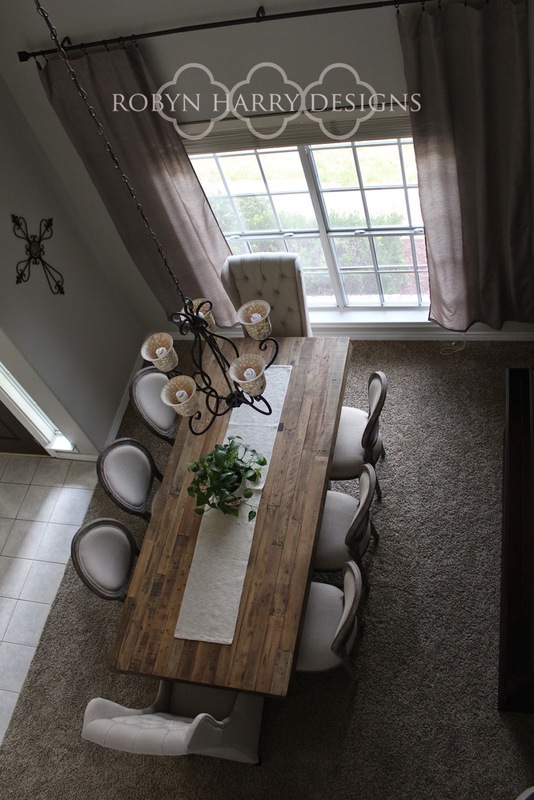 I feel tons of ownership over my newly completed dining room, but I know I couldn’t have done it without her help!! !